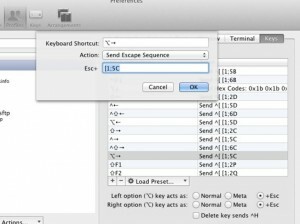 useful way to map “Option+left”/”Option+right” keys in iTerm2 to do by word jump (left and right). Although sending ^[b and ^[f seems to be cleaner. I’ve been trying to get Option-arrow keys to move by word in iTerm2. I figured out a solution, but it’s weird. If anyone has an explanation or a better way to do this, let me know.